Celebrate your milestone birthday with custom printed, reusable plastic party cups. Great for sending home with guests as party souvenirs. Your friends and family will love the custom touch. Our most popular cup size, these 16 ounce cups are personalized with an adult birthday design and your own custom message. The ideal size for holding beer or soda. Choose from a large assortment of vivid cup color options to match your party theme. Dishwasher safe in the top-rack. 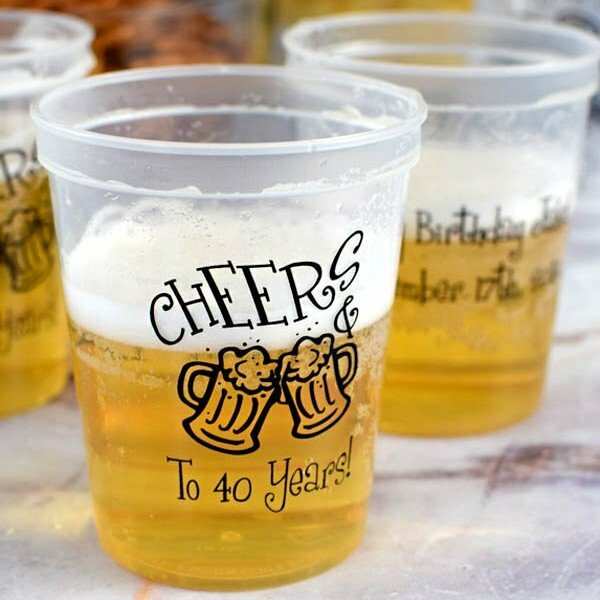 Celebrate your milestone birthday with custom printed, reusable plastic party cups. Great for sending home with guests as party souvenirs. Product was perfect for the 30th Birthday party! I got these for My fiance's surprised birthday. They came out perfect & I can't wait til he see's them. These cups were cute and a perfect way to celebrate this couples shower. Order process was easy and quick. Very happy with my order. My cups ended up better than I expected. The customer service was amazing. They called to let me know that the colors I picked out wouldnÃ¢â‚¬â„¢t do well together and even recommended colors for me. The shipping was fast and IÃ¢â‚¬â„¢m just in love with my product! I recieved this product on time just like they guaranteed. The quality is great and the colors really pop! I canÃ¢â‚¬â„¢t wait to use the cups I bought for a friends 30th Birthday! I really enjoy them. The cups are outstanding. They will be a big hit at the party next week. Items arrived on time and in great shape. Would definitely order from this supplier again. I needed cups for a 40th birthday last minute. Tippytoad accommodated my needs. The product was perfect, and the customer service was above and beyond. I will definitely order for future events. I wanted to have something for my milestone birthday that could be kept as a memory and these cups were perfect! They came out even better than I could have imagined, I'm so happy with the purchase. The only bad thing was that the proof they send is in black and white so I just had to have faith that the colors I chose looked good together. But they were quick to make changes and made sure it was exactly what I wanted. The cups were great. Print looked great and arrived very fast. Shipped very fast and a reasonable price! Cups turned out great. Love them. Will be a great souvenir at the party! We celebrated our daughters 30th birthday and couldnÃ¢â‚¬â„¢t have been more happy with the cups. She loved them and everyone got a take home gift. I ordered cups, with hopes they would be delivered in time for a party.. I didnÃ¢â‚¬â„¢t give much notice, and they arrived on time & they were great.. great job Tippy Toad!! The invitation turned out just like the picture on the site! It was perfect because I had a great deal of information that I needed to add to the invite and it gave me plenty of room on the front and the back. Also, the order came exactly on time. Great customer service and arrived in time. I ordered the clear cups with the black lettering as I thought it looked nice with the beer in it per the example. The lettering is a bit thin. I would have preferred a little bit darker/thicker lettering. Ordered these for my wife's 30th surprise party and they turned out great! Fast processing and shipping! You won't be disappointed! My cups were an amazing addition to my 30th birthday, I ordered pretty last minute considering the delivery date was the day of the event, but the cups were here before lunch time that day! I even called a few days after I ordered to change the size of the cups! And the made the changes without pushing the time back. Will order a again, for sure! Thank you for great customer service and fast shipping! The items I ordered were perfect and came on time. Thank you so much. I will definitely use your company in the future.